“I was one of the lucky folks to get an e-BIke for all of Fall quarter. After having one, I don’t want to give it up. But, since others deserve a chance at trying them out, I will return the one I have and buy my own. The wind and rain haven’t stopped me. Why? Back in August I bought a biking/rain jacket and pants with reflective material. I stay warm and dry when I travel. The wind can be a bit strong–but I haven’t been blown over…yet. The rain pants also keep me warm on these chilly December nights. Because I live close to campus, I don’t even need to bike to work. However, I love going “the long way home” through Fairhaven, Boulevard Park, and back into Bellingham. It takes about 30 minutes rather than 5 minutes, but you can’t beat the scenery or the joy of cruising along the inter-urban trail. My husband and I have been a 1-car family for over 5 years and it hasn’t really caused too many problems. 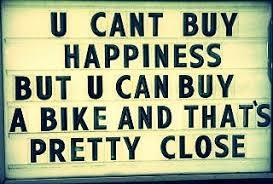 However, having the eBike has really made scheduling easier. I am able to visit a friend across town if my husband wants to drive to a poetry reading in Fairhaven. We don’t have to rush home to get the car to the other person. About three weeks ago I logged my 100th mile. This was pretty impressive because I had only ridden about 20 miles on my regular bike the past 5 years. Biking in Bellingham is not that much fun for those of us who don’t have the physical ability to bike up Chestnut and Ivy and other streets. Since I live near WWU, I always have to go up steep hills to get home. Now with the eBike, those hills still require effort, but they are manageable. The assist is actually helping. Because I bike more than I used to (10-15 miles/week vs. 0), I am finding that I am getting a little stronger–that I can go up more of an incline at lower levels of assist. (I admit, I still need the highest level getting up the steep hills). When I read blogs about eBikes, people seem to complain that they don’t go fast. That isn’t their purpose. I use mine as a commuter bike. It gets me from point A to point B while I am getting more exercise than driving. Plus, I am not polluting the air or struggling to find parking. Really, I am just happy cruising around Bellingham. Thank you so much Jennifer! We couldn’t have said it better ourselves. 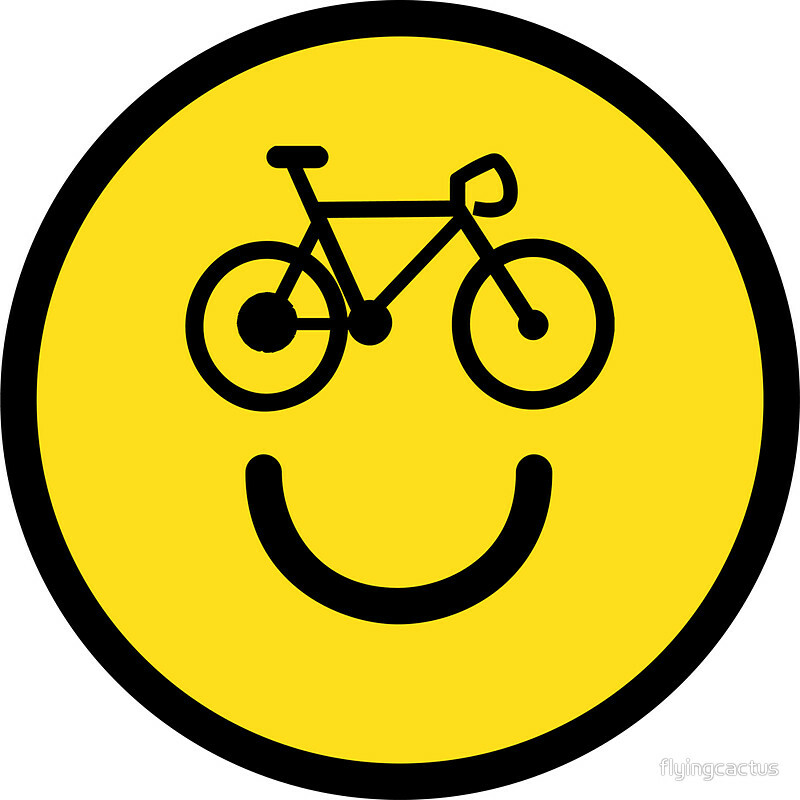 Happy riding is what it’s all about. “Well the time has come, it is the end of winter quarter here on the WWU campus and I have to give up my new best friend, Jasper. Do not be too sad though friends; because she will go on to help other students get up that gnarly hill, get to class on time, and discover cool places they never knew existed. 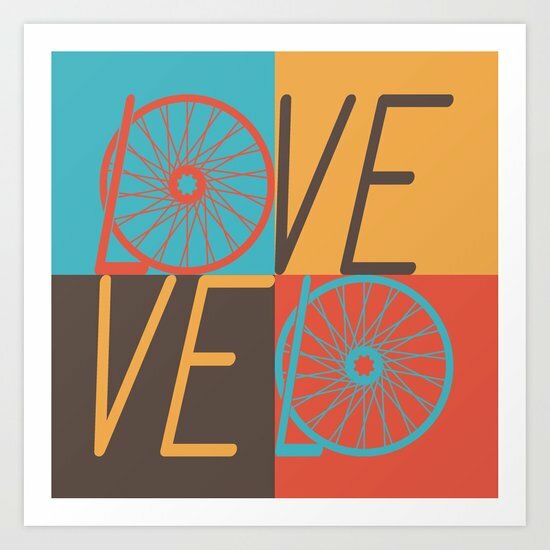 As I walk away from my first eBike experience, I am a believer in this next step in bicycle evolution. I do not see this technology going away, quite the opposite I think we are just getting started with eBikes. I know for myself that revelation happened even before I returned by bike to Western’s Office of Sustainability, as I have been looking online for the past couple of weeks at the amazing array of possibilities and new designs. Don’t get me wrong, I think that the eBikes we have here on campus are awesome and add to our understanding of transportation possibilities, but there are so many options out there for new eBikes that I don’t know what to do. Sure, eProdigy’s Jasper model was easy to ride and made getting around Bellingham fun but now I am thinking a louder horn and turn signals might be something to add. A couple of times during the darkening evenings I think a loud horn or light-up signals would have made me a little safer, but mostly they are just cool. Probably just a matter of time before Giant and Tesla team up anyway. 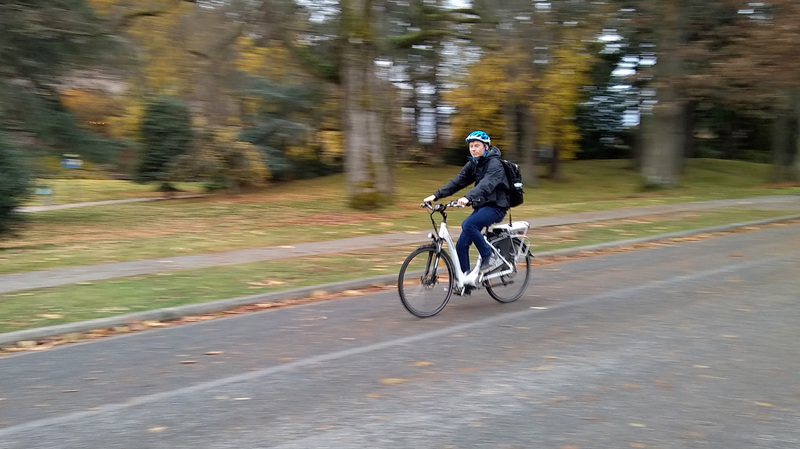 For a non-traditional student who is older and heavier than most, this was a great experience and I am glad that I signed up to check out an eBike. Being active has really helped with school-related stress and something about flying down the hill after a long day of lectures and writing papers just makes college seem fun again, I think it even helped me bump that GPA up a bit. It has been a great quarter and I have loved riding all over Bellingham, yes even in the crazy rain and high winds of November. Ah Dana, thank you for this sweet epilogue to your ten week riding experience with our Jasper eBike. Here at Western Washington University’s Viking eBike program we are introducing the campus community to electric assist bikes. Our introductions are often on an individual basis through our orientations and events. It is rewarding to enlighten someone to the value of the Viking eBikes, and as the Campus Bicycle Educator I get to see their reactions firsthand. 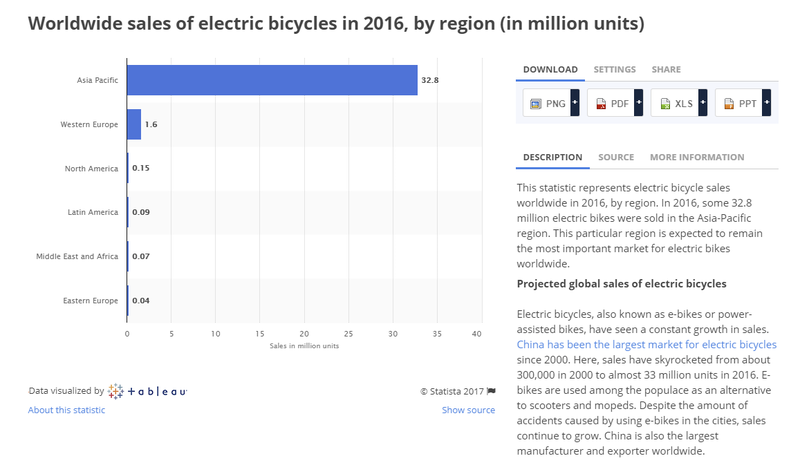 In the greater world, however, the notion of why electric bikes are exciting, useful, and attractive seems to speak for itself. If we look off campus and across our borders we will see the ambitious use of electric bikes and we may get a clue to why millions of people are find eBikes so practical. The Navigant Research group details the reasons behind the growing use of eBikes in a recent article. “Rising levels of population density and traffic congestion are driving interest in different modes of transportation. E-bikes are uniquely positioned to be a primary benefactor of this trend since they are low in cost relative to cars, do not require licenses to operate, and can take advantage of existing bicycling infrastructure.” These reasons are especially relevant in high density cities where congestion is a major issue. 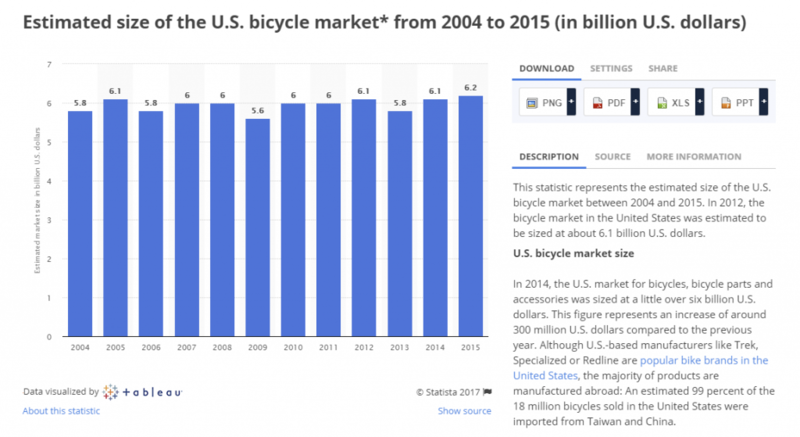 Projections from Navigant Research show that while China clearly does dominate the eBike market currently with manufacturing and usage, their growth will slow and decline in the coming years. 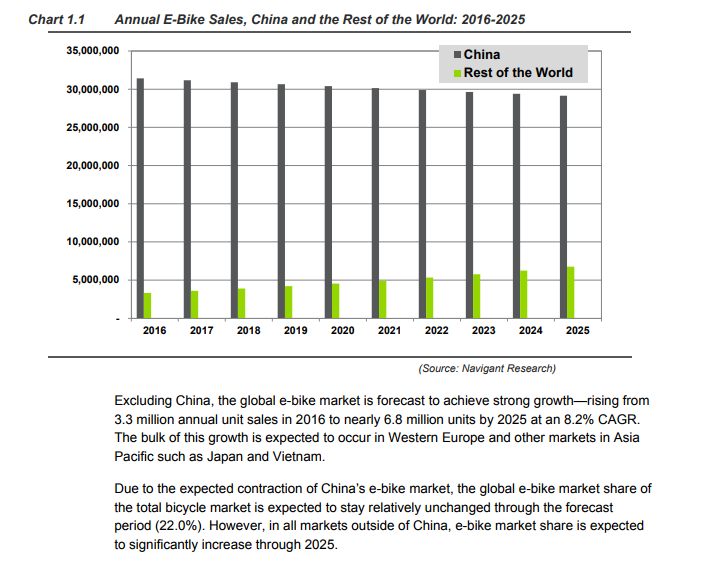 Keeping in mind the greater context of our work at Viking eBikes by documenting the trajectory of eBikes internationally is essential to fully understanding how we can be most effective. Our work does not occur in a vacuum despite it being largely on an individual basis. We are also not alone in the understanding that to create a safer and cleaner 21st century we will need a vast array of individuals, institutions, and enthusiasts supporting the adoption of truly sustainable transportation options. Thanks for your enthusiasm and support, Andrew!